My first downloadable pattern is also available. It is called "Ambrosia 10-Squared", but my favorite thing about this design is that you can use any 10 fat quarters if fabric to create the quilt. (You wouldn't just happen to have 10 fat quarters of absolutely luscious quilt fabrics just laying around, would you?) You just make a few simple cuts and shuffle the fabrics around to create 12 quilt squares. It is versatile and really, really easy! To get a copy of the pattern, head on over to my shop. 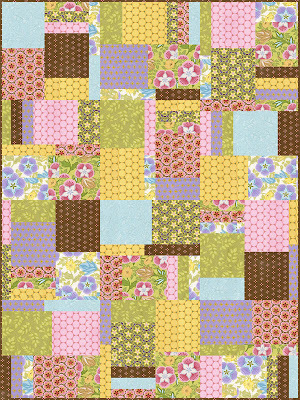 You can make it larger by adding a border or you can also add fat quarters to make additional blocks.